For other uses, see Silsila (disambiguation). Silsila (Arabic: سلسلة‎‎) is an Arabic word meaning chain, link, connection often used in various senses of lineage. In particular, it may be translated as "(religious) order" or "spiritual genealogy" where one Sufi Master transfers his khilfat to his spiritual descendant. Every tariqa has a silsila. Silsilas originated with the initiation of Sufi orders which dates back to the Islamic prophet Mohammad. Most silsilas trace their lineage back to his cousin and son-in-law Ali bin Abi Talib such as the Qadiriyyah, the Chishtiyya, and the Suhrawardiyyah orders. However, other silsilas owe their ancestry to other caliphs such as the Naqshbandiyyah order of South Asia is through the Caliph Abu Bakr. "Theoretically one can only receive instruction in these practices (talqîn) from an authorised teacher of the tariqa, and only after pledging a vow of obedience (bay'ah) to this shaikh. The shaikh gives his disciples permission (ijâza) to practice the tariqa: he may also authorise one or more of them to teach it to others, i.e. appoint them as his khalîfa. In this way a hierarchically ordered network of teachers may emerge. Each shaikh can show a chain of authorities for the tarekat he teaches, his silsila or spiritual genealogy. Usually the silsila reaches back from one's own teacher up to the Prophet, with whom all tarekats claim to have originated although there have been modifications along the way. A Sufi's silsila is his badge of identity and source of legitimation; it provides him with a list of illustrious predecessors and shows how he is related to other Sufis." Silsila can be of a partial knowledge or a book as well. All Hafiz (memorizers of Quran), Muhaddiths (narrators of Hadiths), Qaries (reciters of Quran with correct accent and pronunciation) are given a chain of credible narrators linking to the Islamic prophet Mohammad. For Muslims, the Chain of Authenticity is an important way to ascertain the validity of a saying of Mohammad (also known as a Hadith). The Chain of Authenticity relates the chain of people who have heard and repeated the saying of Mohammad through the generations, until that particular Hadith was written down (Ali bin Abi Talib said that 'Aisha said that the Prophet Mohammad said…). A similar idea appears in Sufism in regards to the lineage and teachings of Sufi masters and students. This string of master to student is called a silsila, literally meaning “chain”. The focus of the silsila like the Chain of Authenticity is to trace the lineage of a Sufi order to Mohammad through his Companions: Ali bin Abi Talib (the primary link between Sufi orders and Mohammad), Abu Bakr, and Umar (three of the Four Righteously Guided Caliphs). When a Sufi order can be traced back to Mohammad through one of the three aforementioned Companions the lineage is called the Silsilat al-Dhahab (dhahab meaning gold) or the “Chain of Gold” (Golden Chain). In early Islamic history, gold was an extremely desired prize and was used for currency, to show wealth and power, and for scientific purposes including medicine. Thus, gold was the most desired commodity in the material world, just as the Golden Chain is the most desired commodity of Sufi orders. When Sufism began in the second century of Islam, according to some experts, it was an individual choice; many Sufis aimed to be more like Muhammad by becoming ascetic and focusing their lives fully on God; more so than the Five Daily Prayers and usual prescripted religious practices. This often included removing oneself from society and other people in general. As Sufism became a greater movement in Islam, individual Sufis began to group together. These groups (also known as orders) were based on a common master. This common master then began spiritual lineage, which is a connection between a Sufi order in which there is a common spiritual heritage based on the master’s teachings (i.e., ‘path’ or ‘method’) called tariq or tariqah. As the number of Sufi orders grew, there arose a need for legitimacy of the orders to establish each order was following the teachings of Mohammad directly; thus the idea of the Silsilat al-Dhahab. 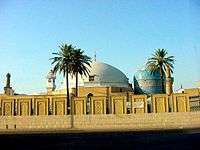 If a Sufi order is able to trace its student to master lineage back to one of the three major caliphs (and in particular Ali bin Abi Talib) who provide a straight link to Mohammad (because of their Companion status with him) then the order is considered righteous and directly following the teachings of Mohammad. In possessing the Golden Chain, a Sufi order is able to establish their order prominently in the mystical world. Shias use it idiomatically to mean a lineage of authentic Masters. 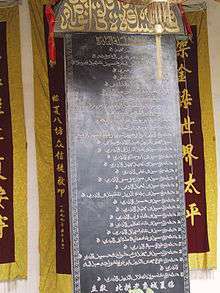 Among Chinese Muslims, the concept of silsilah has developed into that of a menhuan (门宦): a Chinese-style Sufi order whose leaders trace a lineage chain going back to the order's founder in China (e.g., Ma Laichi or Ma Mingxin), and beyond, toward his teachers in Arabia. The term is used as the title of royal family trees and family records of the rulers in the palaces of Java. ↑ Martin van Bruinessen (1995). "Shari`a court, tarekat and pesantren: religious institutions in the sultanate of Banten". Archipel. 50: 165–200. doi:10.3406/arch.1995.3069. ↑ Michael Dillon (1999). China's Muslim Hui community: migration, settlement and sects. Routledge. p. 113. ISBN 0-7007-1026-4. Shah, Idries. The Way of the Sufi. Penguin Books, New York, 1974. Lings, Martin. What is Sufism? University of California Press, Los Angeles, 1977. Ernst, Carl W. The Shambhala Guide to Sufism. Shambhala Publications, Boston, 1997. Karamustafa, Ahmet T. Sufism: The Formative Period. University of California Press, Berkeley, CA, 2007. Crimingham, J. Spencer. The Sufi Orders in Islam. Oxford University Press, New York, 1998.